I'm going to ruffle some feathers here (including, perhaps even my own lovely mother's) and praise Mark Levin for "coming out of the closet" in calling out former president George W. Bush as anything but a conservative in a limited government sense. Levin did so in a Facebook posting about Sarah Palin. Before I move along, I must say that it still shocks and disheartens me when I see my conservative brothers and sisters in the proverbial dark about W's big-government largess and Progressive Co-opted Good Intentions that laid the bricks for the road to Obama's socialist utopia hell. Levin is right and as far as I'm concerned, he's being gracious here. A HUGE component of the Tea Party movement heralds from disaffection with George W. Bush's (and the GOP Congress during his two terms) abandonment of any semblance of fiscal conservatism. The complaint about Bush is that he was the architect of a prescription-drug entitlement. Fair enough, though it should be said that because of free-market reforms, the cost of the plan was 40 percent below the estimates, an unheard of achievement. I'm going a little off topic here but I can't help myself, this is such establishment tripe. The logic goes like this: Democrat-statists float an unconstitutional, fiscal train-wreck entitlement program or any other sundry of horrible legislation. Out-of-power Republicans balk and block said program and claim victory for the taxpayer. 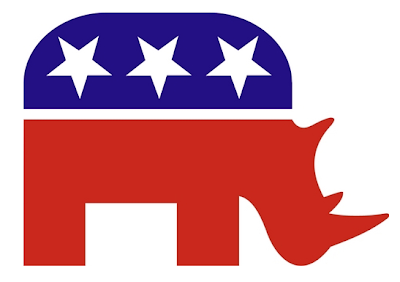 Several years down the road, Republicans gain power and co-opt the unconstitutional, fiscal train-wreck entitlement program or "progressive" government scheme, but they nibble around the edges and *save* 40% for the taxpayer by adding "free market" aspects to the legislation! What do we as liberty-loving Americans that don't believe the Federal government should command every aspect of our lives get in the end by Republican "compromise" of Democrat progressive government? Answer: More of our hard-earned dollars confiscated by an intrusive, out-of-control government, kicking the United States fiscal insolvency can down the road and doing so from the opposition party of limited government. George W. Bush did some good things, for instance the *attempt* of reforming Social Insecurity. The man didn't loathe the United States as his successor does. The list above (grabbed from Paul A. Rahe's column at Richochet) only highlights Bush's domestic policy. His total record can be found here and here. Reagan wasn't perfect as even his best efforts to rein in the Federal government only resulted in slowing the rate of growth. He is still the best measuring stick for true conservatism that we have had in my lifetime and possibly far beyond. Why do I bring all of this up? Simple. Before we know it, Republicans will be choosing a nominee to go up against Obama in 2012. Establishment charlatans will co-opt the Tea Party movement, promise fiscal restraint and sound libertarian-esque. Only those few with proven fiscal-conservative track records will deliver and this nation cannot afford another big-spending Republican administration. 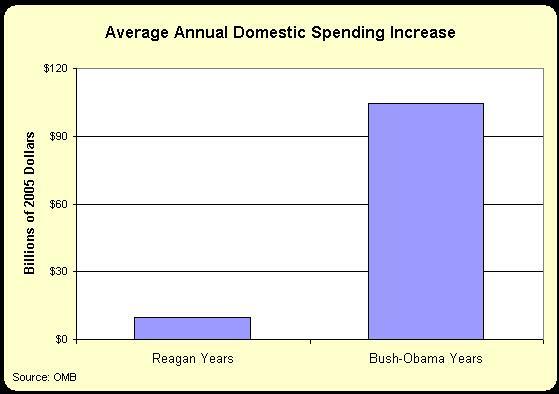 And, oh, yah, just to reiterate -- Bush was no conservative. Please pass this along. Cross posted to The Libertarian Patriot, LCR and RightKlik. I reluctantly agree with you but it's hard because I loathe Mark Levin. However, you mentioned something that is the bottom line to me because what's done is done - GWB was most certainly a progressive but he was one that loved his country which I appreciate a lot these days. Having said that - unfortunately, we'll get more of the same from most of the Republican elite in Congress today. They are part of the ruling class who will never put up with another Reagan-type candidate. Instead, they will Newt and Romney us into another losing candidate in 2012. It horrifies me and I pray for America to wake up and somehow drive these people out of office. It'll take a miracle. Mark Levin is one of the few unflinching conservative warriors in the field. He's right. Bush was no conservative. He was a big-government centrist. The term "conservative" barely means anything anymore. The goalpost has been moved so far to the left, I can't even see it now. If you stand for limited government, constrained by constitutional boundaries that protect individual liberty as defined by the Bill of Rights -- as well as secure borders, strong families, cultural unity, natural law, minimal statism and maximum freedom -- with national defense that can protect all that... what are you? A right-wing extremist? Without the Bushes there would be no Tea Party because limited government folks would have something of a home in the GOP. The TP isn't a response to Obama its filling a vacuum in American politics left by the GOP's abandonment of any free market principles it might have held on to. hard to improve on this factual recitation of the facts...sad as they are. other than dat, these past 10 years have been 'great' and 'peachy=keen' when it comes to fiscal responsibility and integrity and brains. MJ - Thanks for the comment, its up to us to get the candidate we deserve, third party or otherwise. RK - Right-on. I agree completely with your list of charlatans, I have a very bad feeling that we are going to get 'stuck' with a real turd in 2012. Shane - Well said, I could argue that we are still in the wilderness, so to speak. Look at how the GOP leadership (with the $100 billion Obamacare funding/continuing resolution) has already shafted the people that sent them there. Frank - We are on the same page, completely. I can only imagine my distress, had I been there in person, as you were. I think Shane said it well. " The TP is filling a void left by the GOP"... Thus why we are as RK said," right-wing extremist" simply because we contrast the our opposition and the so called "Conservative" party. Just had another thought... "I have a very bad feeling that we are going to get 'stuck' with a real turd in 2012." It may very well be another case of voting for either a turd or a not so stinky turd. Dan Mitchell had another post on Big Government comparing GWB's domestic spending to Clinton and Reagan. Either Bill was a closet conservative or GWB was a raging progressive in conservative clothing. I'll go with the latter.